...or Save Me First, I'm a Farmer. 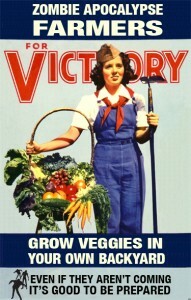 This is what happens when you combine a Victory Garden with the Zombie Apocalypse. You get the Zombie Apocalypse Farmers Corps. Not to be confuse with "corpse." Don't laugh, spoilers say this season The Walking Dead will feature raised beds and chickens. When Kathy Voth and Leah Ashley Esser were looking for a way to make gardening fun, they thought of Zombie Victory Gardens. We defeated Hitler, we can defeat the Governor! Frankly, if we are depending on my garden this year to save us, we are royally screwed, but it's the thought that counts. So, if you think the zombies are coming, join the ZAF Corps. and "Quick! Plant something." Don't count on my garden to save us - squash vine borers fended off only to have plants succumb to squash bugs. No need to get out the canning jars for the tomatoes either. It's the first time for complete nasturtium crop failure. How can that be? Oh, well, we've got plenty of pesto to go around.